SoLoMo Banking. La Caixa taps social local mobile with PremiaT, the 1st online community that connects businesses and individuals. It is designed to help businesses and retailers drive direct sales and generate customer loyalty. 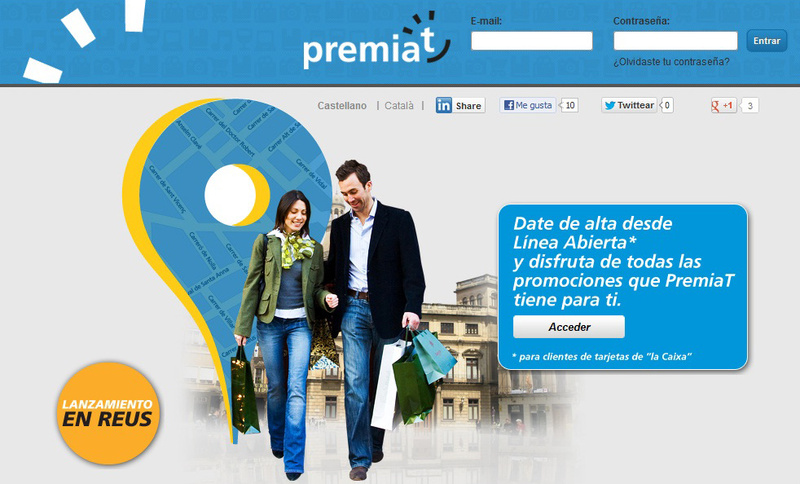 PremiaT gives access to consumers to offers and promotions around their locale anytime using geolocation technology. It also allows businesses to circulate offers among several potential customers. To use it, customers have to register for free at www.premiat.es. However, individuals must give a la Caixa card and commercial establishments a POS terminal from the bank. Using geolocation technology and a search tool provided in the virtual community, customers can find offers and the establishments that offer them on a map. They do not need to print vouchers as the offer is readily activated at the point of sale terminal and is applied automatically. Businesses benefit from the promotion as well with their POS terminal. PremiaT will be rolled out in stages. The first will be this December with the launching Reus system, which targets POS terminal holders – 30,000 customers and over 1,200 retailers. It will start out with 60 from bars and restaurants, 53 from clothes and accessories shop, 52 from computing, household appliance, and decoration retailers, 35 from spas, beauty salons, and health centres, and 33 from leisure and travel establishments; all in all 233 active promotions. Promotions come in free gifts and discounts – 30% for fashion items, 50% for individual items and services, and 40% for new tyres fitting. Due to this, la Caixa is regarded as a leader in innovation. It is currently leading in electronic banking with over 200,000 merchant banking customers and over 12.5 million card customers. It also has the most extensive ATM network with over 10,000 terminals. It is also leading in online banking with 8.6 customers, and mobile banking with over 2.8 million users. Have your financial institution been experimenting with Social Local Mobile recently? We invite you to share your thoughts on this initiative, as well as your best practices on ‘SoLoMo’ and online communities in financial services here, via twitter or on our Facebook page.